By anophthalmic we refer to the orbital cavity resulting from extraction of the eyeball either by evisceration or enucleation. In cases of exenteration, we remove all the eyeball and adjacent orbital structures and therefore this also acts as anophthalmic cavity, although in this case complications are of another type. - An internal or orbital one: this inner ball is a prosthesis replacing the volume of the removed eye (evisceration or enucleation). The oculoplastic ophthalmologist performs this. It is a non-biological implant. This prosthesis is permanent and visible, biointegratable (with vascularization and therefore integrated into the surrounding tissues giving it mobility). - Another external: cosmetic. 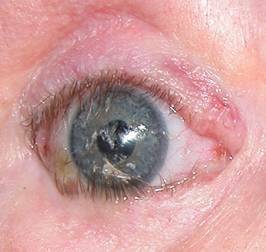 This is visible prosthesis, similar to the other eye. 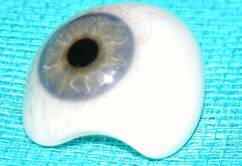 Carved by a prosthetic eye, not by an ophthalmologist, but by a professional ocularist (not to be confused with an ophthalmologist or optician). This prosthesis is under the eyelids and can be removed for cleaning at the patient's convenience. Whenever we extract the eyeball, the orbit will undergo a series of important anatomical and functional changes, and surgery related to the existence of the two prosthesis that patients will carry throughout their lives. These changes can cause medical or cosmetic consequences that we will discuss. Very common in these patients. The major anatomical changes that arise after surgery cause loss of lubrication. 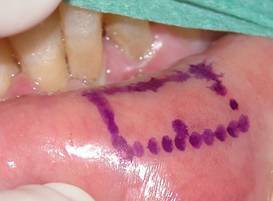 Secondary irritation by the prosthesis produces excess mucus. 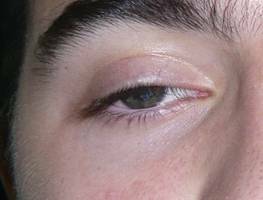 Other times it may be due to conjunctivitis by rubbing with cosmetic husk or by exposure of internal prosthesis of the orbit. We must analyze whether the scale is the right size. Usually improves with lubrication drops or ointment, and the application of anti-inflammatory drugs. Also vitamin E or aloe vera have shown a favorable effect. It is a relatively frequent complication that can affect 20% of patients, especially those who have suffered a tumor enucleation and were subsequently treated with radiotherapy. 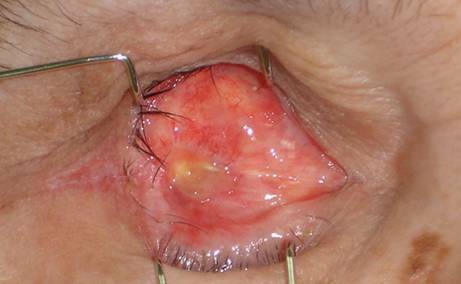 They are more frequent in patients having undergone enucleation as compared to evisceration. Influencing factors include the type and size of prosthesis and the eye extraction technique employed. Other factors are irritation and continuous rubbing of the tissues. Depending on the size of the exposure treatment will vary from direct closure to applying lip or lipodermal grafts. The lipodermal graft is a widely used tissue in oculoplastic surgery. It involves removing the layer immediately below the epidermis along with the underlying adipose tissue. We therefore eliminate the hair follicles layer. 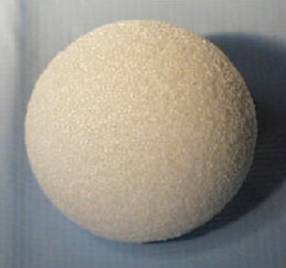 It is a versatile fabric used to treat dehiscences (holes in tissues operated) or as filler and support material. It can be removed under local anesthesia. The donor sites are the buttock or near the navel. In this case the prosthesis does not come out unless it moves inside the orbit. This is less common with the type of prosthesis that we use today, as it soon becomens vascularized and is fixed in the center. It is very common. 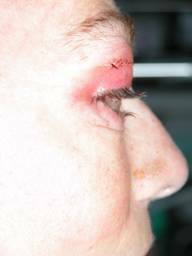 It involves a collapse of the upper eyelid area under the eyebrow, usually due to atrophy of orbital fat, lower displacement orbital prosthesis or increased laxity of the eyelids. It produces a cosmetic defect which is sometimes very noticeable. Treatment depends on the cause. In cases of inferior displacement we must introduce grafts in the orbital base to raise the prosthesis. If it's a problem we can use fat atrophy lipodermal grafts, flaps of adjacent tissues, ultracentrifuged fat injections or hyaluronic acid fillers. It is a complex problem. The eyelids are shrinking and the patient is retaining the prosthesis, sometimes leading to total occlusion of the cavity. It is more common in children. Spacers are used to change every portion. Other times we need to expand surgically to create new spaces, introducing grafts. 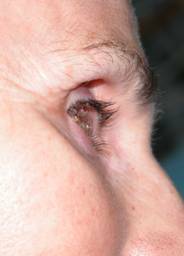 Palpebral ptosis occurs due to insufficient prosthetic volume, by displacement or by continued rubbing of the eyelid upon the cosmetic husk. After analyzing the cause, treatment is surgical. 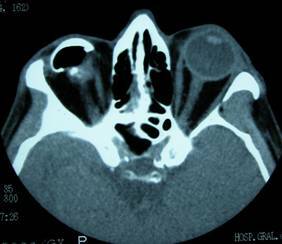 Eventually eyelid tissues may yield under the weight of the husk, so it is important that the entire cavity volume does not fall mainly upon the scale, but upon the orbital prosthesis. Once enucleation surgery has taken place, your ophthalmologist will refer you to an ocularist for cosmetic husk carved within 3-4 weeks. Meanwhile must keep a beamformer (transparent plastic hulls) in order that the eyelids are not contracted. Dentures just do not really need care. It must be removed daily. The patient has to get used to it and not take it off to sleep. It should be handled as little as possible, once a month for cleaning. 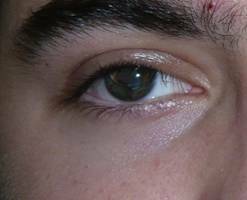 Abundant lubrication is necessary using eye drops or ointments.